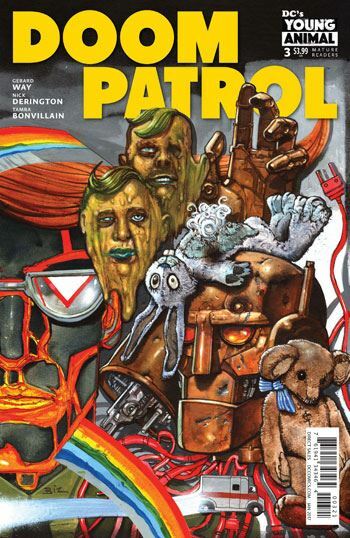 Thank you, Gerard Way, for writing Doom Patrol. In my review of the first issue, I mentioned how difficult a series this was to pull off well, to capture the bizarreness but still stay grounded enough to keep the readers engaged. It’s not an easy task. From the start, it looked like Way and Derrington had found a successful route into the team, and this issue confirms it. There is a lot going on in this issue. Some clarity is given to the unusual plot thread Larry Trainor is experiencing, to a degree having been separated from Negative Man. Robotman is involved in that, one old friend helping the other. And the Chief gets another weird but entertaining cameo. But the story in this issue really revolves around Casey. Flex Mentallo takes Casey on a tour of Danny the Street, in his new “residence,” and puts her on the Doom Patrol ride. This leads to the most enjoyable pages of a hugely enjoyable issue. The ride features imagery from both the classic run, and Grant Morrison’s tenure on the title, evoking all manner of pleasant memories for those readers with a background on the team. And then it veers into a new oddness all its own, as we learn what and who Casey really is. Morrison would have applauded. And so would Keith Giffen, I think, from the Existential Crisis page, which sure looks like it features Blotto the Clown from the Uh Oh Squad, a character never before seen outside of Ambush Bug stories. Please, Mr. Way, continue to mine through the crazy past of the team and forge new madness for us all to enjoy!